The nine single-digit numbers, 1 through 9, each have very specific, easy to recognize attributes. The 0 (zero), however, has no attributes, no character traits, no description whatsoever. It's a blank page but with a twist. The zero is the chameleon, the great enhancer, the multiplier and the gateway to infinity and immortality. 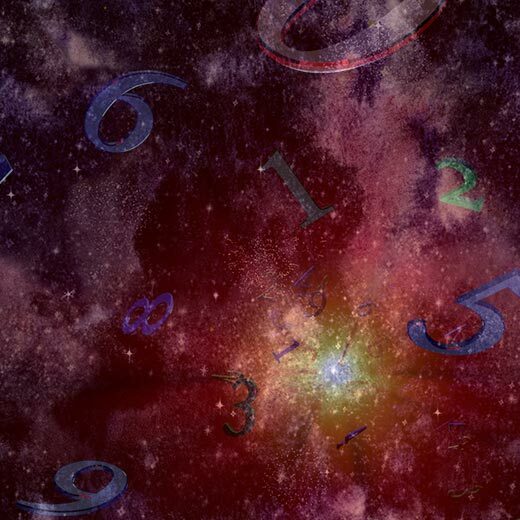 When the number 0 is found in a Numerology chart, it is always the result of one or more deductions -- after all, it is not possible to add two numbers and arrive at zero. And whenever numbers are deducted, it's done in order to find a shortcoming, a weakness or a missing link. The zero then takes on the attributes of the 9: global awareness, compassion, tolerance, love and sacrifice, hence its nickname of "The Mother Theresa number." This makes sense in the usual elegant way of Numerology, since the number 9 can never be found as the result of deducting any single-digit number from another single digit. The zero also has the ability to fine-tune and enhance the qualities of any other single-digit number. The 10 becomes a higher octave 1, the 20 raises the qualities of the 2, and so forth. All of this is relatively mundane. It gets much more interesting when you pull the zero out of the environment of personal Numerology charts and look at it from a different perspective. For as long as we can remember, a dialog has been going on between those who think everything started from nothing and those who believe that in the beginning there was something. And you and I, as children and young adults, found ourselves standing in between and getting an earful from both sides. Most of us chose a side early on and went on with our lives. Then there are some of us who just can't make up our minds. I have to admit, for a long time I was one of those. My parents never propagated one side or the other, so I was left hanging, free to make up my own mind, which I did eventually. Here's my two pennies worth: both sides are correct and both sides are wrong. I.e. : zero is something, and the something we refer to as the origin of everything is nothing. I know, this sounds plain ludicrous. But as a useful analogy, let's look at the most important numerology development since -- well, since forever; the application of the 0 and 1 as the basis for everything digital. The symbolism here is beautiful. In what is, without a doubt, a time of exponential growth, we come up with this fantastic concept that, when it comes to finding answers for everything, only the 0 and 1 matter. Enter the digital age. But let's get creative and put it another way: Can consciousness exist without unconsciousness? Or: Can immortality exist without mortality? Oh boy, this is really tricky. Because eventually it gets you to the final question: Could there be nothing at the beginning of everything without there being something? Or could there be something without there being nothing? I will refrain from answering these crazy questions. I am just dropping them at your feet to do with as you please. As for me, I am happy to know that asking these kind of questions is extremely satisfying and enjoyable, even as I am convinced that the answer is worth absolutely nothing. At least if the answer is a product of the mind and subsequently accepted or rejected by said mind. All the brain power in the world can't produce the answer because it doesn't exist in the world of zeroes and ones, or any other number. It never will. This is one question to which the answer cannot be spoken or thought or expressed or judged or touched or even imagined. That's not where the answer exists. What you can do though, is look around. See the way a father holds his child, watch a teenager risk his life to save a dog from drowning, recognize the depth and sacred consciousness in the eyes of a horse, smell the smells of a wet forest, look at the oon and the stars on a clear night, sit on a terrace with a double espresso and feel the sun on your shoulders. You can let your heart be touched by the generosity of strangers or the bravery of a soldier. You don't have to judge any of these things. You can just let it happen, and it always, and I mean always, feels good. And when you feel good, "IT" feels good, and it no longer matters whether the origin of everything was nothing or some "thing". All that matters is what exists now, you, me, everything else, and "IT." Whether that "IT" is something or nothing doesn't make one iota of a difference.